I bought my first pair of real pair of running shoes in February of this year. Yes, you read that right...this year. Prior to that I ran in the cheapest pair of "running" shoes I could find at WalMart. My friends and family kept finding races for me to run and so I would buy another pair saying that I was "just training for this next race and then I'm not going to run any more." Never mind the fact that each pair was shot by the time I got to said race, committing to real shoes meant admitting that I was starting to like this crazy sport and that I actually considered myself a runner. But this February I decided to take the plunge and actually commit to a pair of quality running shoes that would last for more than 100. I decided to go to a local shoe store, Vertical Runner, known for it's excellent service and knowledgeable staff. The woman there tried VERY hard to help me pick out the perfect pair. She had me walk across the floor in my socks to observe the bio-mechanics of my feet, sized my foot with the shoe size thingamajig and proceeded to ask me a number of questions about what exactly I was looking for in a shoe. I was honest with her that I was looking for something light weight but beyond that, having never owned any real running shoes before, I had no idea what I was looking for. She said that I had no pronation issues and didn't need a ton of support and headed to the back to bring me nearly a dozen different shoes to try on. I tried on every pair. Some shoes I immediately didn't like but most of them I just said, "I don't know...Lets try the next pair." Finally I settled into a pair of Mizuno WaveRider13's. They were the most comfortable shoes I had ever worn. Over the course of the next few months my mileage increased from 30 or so to around 45 miles a week. I grew stronger and faster. The only problem was that, prior to owning my Mizunos I had been a solid mid-foot striker and suddenly it was a challenge to land mid-foot. After doing some research I decided that I needed a more minimalist shoe. Something with a lower heal to toe drop. 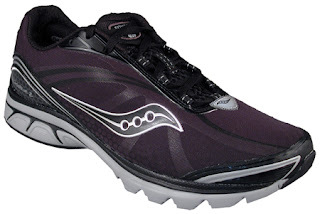 When my shoes were well past the 400 mile mark I returned to Vertical Runner and after trying on all of their minimalist shoes settled on a pair of Saucony Kinvara2's. When I tried them on the clouds parted, the sun shown brightly on my face and Handel's Messiah began to play. They were the perfect fit! Now, Saucony's own website says that when transitioning into more minimalist shoes you should start by only using them for 10% of your weekly mileage and build up from there. Who were they kidding!?! Don't they know that my shoes are shot? I don't have time for that! I'll just add in an extra rest day and it'll be fine. ...or not. After the first week I had excessive pain in my calves. The second week was a rest week and while the pain didn't get any worse, it didn't get much better either...and my Achilles tendons began to bother me...alot. The third week I decided to add another rest day after my speed work, reducing my running to three days a week. Finally some progress! By the end of the week I was feeling great and ready for my long run. It was a beautiful run! I felt great all the way through it! Finally, victory was mine! That whole 10% rule was bologna! Then it happened... The moment my feet were both planted on the ground my calves clenched up so tight I had to grab a hold of the nearest tree to keep from falling on the ground. Chanda and the kids were planning on picking me up at a trail head nearly a mile further down the trail and here I am bear-hugging this tree because it's the only way to stay upright! And to make matters worse, people were staring! I just hung there for a moment waiting for my calves to relax. They didn't. So slowly I began to stretch them out. I HAVE to be able to walk at least one more mile! The pain brought tears to my eyes. More people walked by unashamed to stare at the weird guy clinging to the tree. After about ten minutes I was able to put weight on my legs again. Slowly I began to resume forward progress toward the trail head where Chanda, my beautiful children, and most importantly the car were waiting for me. It has been about two more weeks since my embarrassing incident on the trail and I am happy to say that I am now running pain free again! But there is a moral to this story. When a shoe company says to ease into a shoe take there advice. Because, as I tell the kids at church, lessons learned the hard way aren't learned better, they just hurt more. My running friends have the habit of asking me at the beginning of any race what my goal is. They don't believe me when I tell them that I don't have one. No really. I don't have any time goals. I don't have any PRs to set. No course records to accomplish. No age-group awards to achieve. Not this year anyway. Don't get me wrong... the temptation is there. I know what it feels like to have my name called for an age group or an over-all award, and it feels freakin' awesome. It's an addictive feeling... a feeling worth chasing. But I have, at least temporarily, just for this year (hopefully), traded in the pursuit of speed for another goal, to stay uninjured! The story of how I became a runner is a story for another day, but I can tell you that I've spent almost all of my time as a runner suffering from one injury or another, to the point that a physical therapist told me that should I continue on my then current path, I would have a few really good years and then probably never run again. That terrified me. I need to be able to run. Come on now, I have five kids... I NEED to be able to run! So my goals changed. My approach to running changed. This year I have found myself mentally invested not in running as far and fast as I can but in being able to run for my whole life. I have the best physical therapist in the world, who is also a personal friend, so we've worked together (and by "worked together" I mean argued, debated, and I may have stuck my tongue out at her) to reach a compromise that allows me to train for the marathon but in a way that doesn't sacrifice running long term for running long distance. I do all my exercises. I have pulled back, slowed down, done intervals. I have been a good patient. On Monday I found myself needing a change. I felt sluggish, bored, slow, tired of my carefully paced interval runs down the same old trail. I needed a change. Our neighborhood is completely boxed in by a beautiful blue line that marks the course of the Akron Marathon. I decided to chase it for a while before hitting my usual trail head. We've lived in this house for about a year and in favor of trail running, I've never run my own neighborhood. On Monday I headed out from my front porch and took off after that blue line. I don't know what came over me after that because the next thing I knew I was pounding out seven minute miles, leaping over curbs, Pope's "The Moment" pulsing in my earbuds. I passed a small business district and was shocked at the woman running beside me in the reflection of the store front windows. She was poised and confident. She was fit and she was fast. Several men drove passed her and honked their car horns, "Hey, how YOU doin?!". And for just a few more miles I was that woman. In that moment, for those few idyllic miles, the time on my Garmin didn't matter. It wasn't about PRs or miles logged, or training plans, or magazine articles, or races, or gear, or starting lines. It wasn't about what would happen in the future, it was about what was happening right now. It was about the concrete under my feet, the air searing my lungs. The sun setting in the distance. It was perfect... and it was fleeting. Eventually I became aware of my location, got scared that it was getting dark, watched a guy check me out and tripped over my left foot, skidded on someone's gravel driveway, laughed at myself, and headed home at a much slower but more responsible pace. No longer the poised woman in the window, just me, bee-bopping along in a faded 10K t-shirt, my curly hair creating a fuzzy halo around my head in the humidity, scrambling to make the uphill journey home. Monday's run wasn't about checking off miles on a training plan, it wasn't about safely pursing a goal one small step at a time. It was just about running. It's easy to get wrapped up in all the extra stuff that seems to come along with being a runner. But like any other girl, if running is your mistress, it's important that every now and then, even if just for a few miles, you remind her that you still love her, just the way she is.